With essays by more than 25 writers from around the world, this collection presents a diverse and usually engaging, arguably comprehensive cross-section of some of today’s best nonfiction. Since their perfection by Montaigne, essays have gone through any number of peaks and sloughs of popularity. Now they are such the rage that creative writing programs are rushing to offer essay MFAs. As surely as any tulip craze, it’s a bubble, one that is responsible for most of the least successful essays here, with their pointless autobiographizing, tedious solipsism, and strained preciousness. Fortunately, given the size and breadth and general quality of this collection, these few clunkers can be quickly and almost harmlessly skipped over. Overall, Lopate (Portrait of My Body, 1996, etc. 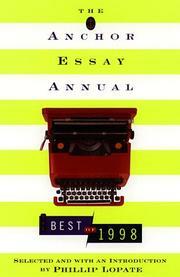 ), in his second stint as editor of this collection, has done a signal job of amassing and arranging a number of challenging, revealing, even startling essays—although, with contributions from such notables as David Foster Wallace, Luc Sante, Edward Said, and Francine Prose, it’s hard to go too far wrong. Topics range across the full spectrum of the comÇdie humaine, from birth to divorce to death and everything in between. Yet there is a charming quirkiness to many of the selections, a necessary unnecessariness that reveals more than a more conventional, straightforward essay might. For example, there is Edward Hoagland on his encounters with wild animals, Margaret Talbot on ’50s pin-up legend Bettie Page, Emily Fox Gordon on being a faculty wife. Lopate has managed to put in something for everybody without most of the dumbing down and leaden compromises such a popularist enterprise usually requires. Like a box of chocolates, full of surprises—and usually good ones: A few more collections of this caliber, and Anchor might just have an institution on its hands.